Is Vitamin D in Food enough? More then 50% of Americans suffer from Vitamin D deficiency which can weaken the immune system, affect muscle and bone health, and most commonly impair mood and concentration. Fight off the winter blues with a blast of sunshine containing 60,000 units of Vitamin D.
Vitamin D (calciferol) is a fat-soluble vitamin that is essential for human health. It is also called a steroid vitamin, because it increases the metabolism and absorption of calcium and phosphorus. Normal sunlight is actually adequate for the production of Vitamin D in the skin. Vitamin D-rich diets reduce the chances of disabling fractures. A good intake of calcium will not keep the bones strong if vitamin D is missing or lacking. This is something that is particularly important for those that are older. As we age, there is a greater risk of osteoporosis and other vitamin deficiencies that can lead to bones being broken more easily. Additionally, balance tends to be not as good as what it was, so there is a higher chance of falling. Falls lead to breaks, so it is important to get enough vitamin D to lower the chance of something fracturing in the case of a stumble or other accident. Vitamin D also helps in treating rachitic rosary, which manifests in bead-like bumps seen at the joints of the ribs with their cartilages. This condition is often found in people already suffering from rickets, scurvy, or chondrodystrophy. It is a lack of calcium that causes an overgrowth of the joint cartilage. Vitamin D is a natural way to treat the problem because as mentioned before, the vitamin helps the body better absorb the calcium in the way it is supposed to. If you are worried about being vitamin D deficiency, or if you are suffering from any of the above disorders, you should talk to your medical professional. He or she can do testing to find out if your body is lacking in this essential nutrient. Then a proper recommendation can be given on how to get what you need either through food, sunlight, or supplements. ​Rickets is a skeletal disorder caused by the deficiency of vitamin D, phosphate, and calcium. It is identified by an X-ray examination of the bones in the legs. 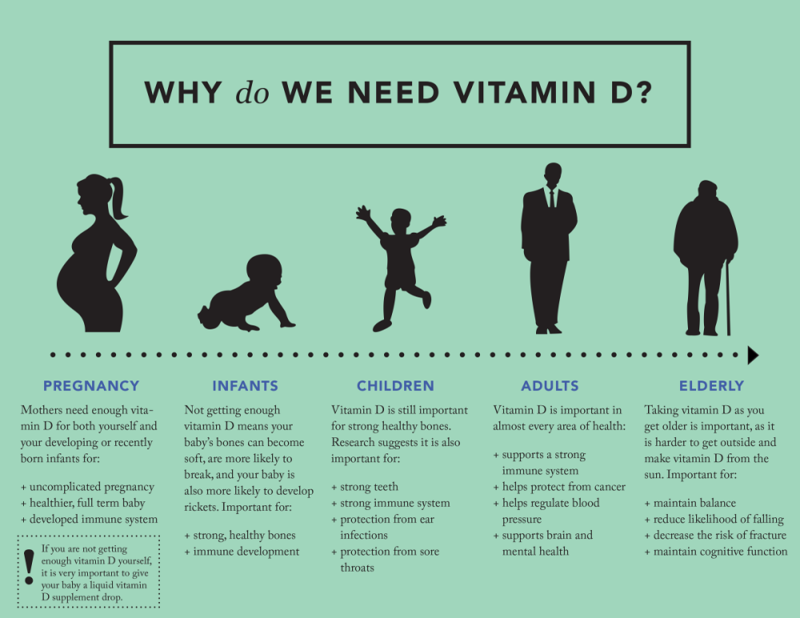 Rickets can be cured quickly with an extra dose of oral vitamin D. During the treatment of rickets, a doctor monitors the levels of 25-OH-D in the plasma to raise it to a normal value. The abnormalities in the bones will then slowly disappear. For rickets caused by the deficiency of calcium, a supplement of extra calcium must be given along with the dose of vitamin D.
Osteomalacia means soft bones, and the disease of the same name refers to there being an issue with bones being weak or brittle. The collagen fibers found in bones are covered by minerals. The strength of a bone depends upon the rich mineral coating over the collagen matrix. The mineral coating, if found in a significant quantity, forms a strong bone. Osteoclasts eradicate old bone and osteoblasts manufacture the new collagen matrix. Osteomalacia takes place if the process of formation of the mineral coating does not take place correctly. In this disease, new bones are formed without the mineral coating, which leads to softening of the bones. These types of bones may crack or bend easily. Osteomalacia is treated with an oral dose of vitamin D and direct exposure to the sun. When there isn’t an option for natural absorption of sunlight, UV lamps have often been used as a replacement treatment. ​Peripheral artery disease (PAD) occurs when there is a circulatory issue that keeps the blood from flowing properly to the limbs as it normally would. Most commonly the limbs don’t get enough blood, and as a result, there is pain felt during any movement like walking or otherwise. In severe cases, critical limb ischemia, stroke, or heart attack can occur. Vitamin D reduces the chance of peripheral arterial disease. It also helps the body to absorb calcium, which is essential for our bones. Children are asked to sit in the sun for a moderate amount of time for the absorption of vitamin D, in order to prevent this terrible disease. ​Studies have shown that a high intake of vitamin D can slow the progression of various types of cancers and cardiovascular diseases. It helps to protect against cancers of the prostate, lung, skin, and lymphoma. According to a study by the researchers of Medical Services Department, Torrent Pharmaceuticals Ltd., Ahmedabad, Gujarat, India, vitamin D lowers cell proliferation and raises cell differentiation, which prevents the growth of new blood vessels, and has noteworthy anti-inflammatory effects. It suggested a link between low vitamin D levels and a higher risk of cancer, with most pieces of evidence pointing towards colorectal cancer. In the Health Professionals Follow-up Study (HPFS), by Ahn J, Peters U, Albanes D, Purdue MP, Abnet CC, Chatterjee N, et al. subjects with high vitamin D concentrations were unlikely to be diagnosed with colon cancer. In other experiments over the course of many years, it was determined that the people with the highest level of vitamin D in their systems had a 22% lower risk of cancer developing. Vitamin D supplementation is vital to well-being. Schedule Your Vitamin D Boost Today!